Description of adults. Original description (Meyrick, 1912) based on 1 : " . 13 mm. Head pale greyish. Antennae dark fuscous. Thorax purplish. Abdomen grey, lateral claspers and supraanal projection longer and narrower than in caustica. Forewings ovate-lanceolate, less acute than in caustica, stalk of 7 and 8 extremely short; deep purple, irregularly mixed with coppery-golden, darker and bluish on costa; four subquadrate ochreous-whitish spots on costa between base and 3/4, larger anteriorly, and a dot towards apex: cilia grey-whitish, with several dark grey bars. Hindwings violet-grey, darker towards apex; cilia grey-whitish, on costa barred with grey suffusion." Meyrick, E. 1912. 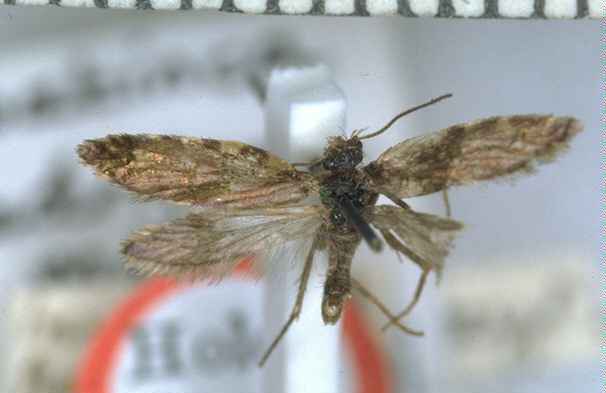 Descriptions of New Zealand Lepidoptera. Transactions and proceedings of the New Zealand Institute: 117 - 126.